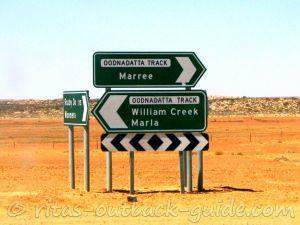 How good/bad are the Diamantina Development and the Birdsville Development Roads, (Windorah to Birdsville)? There are plenty of write-ups about the Birdsville Track, and there seems to be a consensus that you could easily travel it in an ordinary sedan these days. I'm fairly experienced in outback travel, however my vehicle will be a Subaru Forester, which isn't as big and hairy-chested as your land cruisers, Patrols etc. Any issues with ground clearance? My belief is that even the best 4WD is only as good as the nut behind the wheel. "My belief is that even the best 4WD is only as good as the nut behind the wheel." You are definitely right with this conclusion! 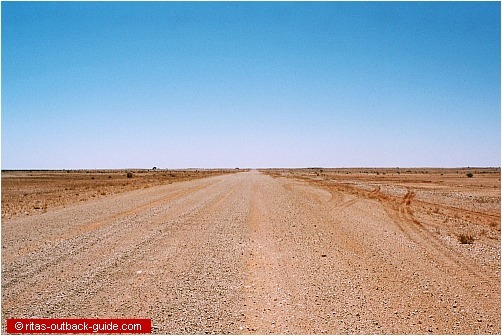 The Birdsville Track was very stony when I travelled it years ago. It was there that we had the only flat tyre of all Outback trips. Obviously, we hadn't lowered the tyre pressure as much as we should. I thought the road north of Birdsville was even rougher than the BT itself, with lots of sandy patches. The Diamantina Developmental Road is sealed from Windorah to the junction with the Birdsville Developmental Road. The Developmental Roads are maintained frequently. However, after rain they can be quite rough, with washouts and deep wheel ruts. 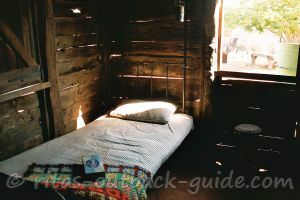 As an experienced Outback traveller you certainly know that any statement about conditions on a certain road is only true today, and can be rather different tomorrow. Please understand, I try to avoid statements like "You can do this track/road with that kind of car", because it depends on the conditions on the day you go out there. As of today, the Birdsville Developmental Road is recommended for high-clearance vehicles only. But this might be different in a month. With this Outback Guide I try to convince even first time travellers that they can explore the Outback (as long as they don't start with the Simpson Desert on the first trip), and offer help to prepare their journey. Even if I repeat myself, a successful trip depends on how well the driver is prepared, knows his car, the weather, and current road conditions. It is good to ask the locals, even better oncoming drivers, before one gets out on a lonely stretch of road. For the latest road conditions call 1300 130 595 (recorded), or check the road conditions on the Diamantina Shire Council website. 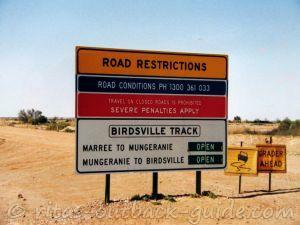 Just wanting some up to date info on the birdsville to windorah rd....any info appreciated. Hey, I rode an old ex-army dispatch rider's bike from Alice Springs to Port Augusta on what is now called the "Oodnadatta Track" back in 1959. That road was then called the Stuart Highway, and was the only north-south track in existence. The bike was a BSA 250cc, four-stroke. I carried a full back-pack, a couple of gallons of water on one crash-bar, and a jerry-can of fuel on the other side. The road was B**** terrible, mostly because the trucks tore it up, especially if it got a bit wet. So, if you are considering riding the Birdsville track, it should be fairly negotiable these days because SA Roads have done some work to iron out most of the bumps, making it fairly "bike-friendly". Further to yesterday's comment about camping along the Windora to Birdsville road, have a think about diverging north to "Old Betoota". Not sure what's there now, but it might be worth a look. Plenty of camping spots; none of them marked as "official", but you should be OK if you pull well off the road, and don't camp in a creek bed. Be careful of soft spots, you may become bogged if it's loose sand. Having said that, I haven't been down that road for a long time, (several years), and Queensland Roads may have done some work setting up "approved" camping spots. We would like to travel to Birdsville in our 1988 Coaster Motorhome next year - an oldie but a goody. 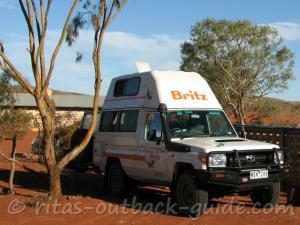 Are the roads from Windorah to Birdsville and then on to Boulia OK for an on-road bus like ours? When is the best time to go considering weather and road conditions? Depends very much on the state of the road. I'd strongly advise contacting Queensland Roads to get the latest. Do not attempt it if the road is covered in places; there's many a motorist that's been bogged up to the door handles in innocent-looking puddles. If you come across a puddle and there are fresh tracks around it, follow those by-pass tracks, (as long as you can see the re-entry back onto the road). Some by-pass tracks are actually turn-offs, headed for various station features, or even exploratory boreholes etc. If you get a straight-through run, I reckon you could do it in a 6-7 hour run. Planning a trip to Birdsville this year. Can any one tell me how long it take to get from Windorah to Birdsville? This being on a good track. Its the AWD Kluger,low klms,new tyres. I have two spares now and a compressor,hand pump and a tyre depression gauge in my kit. A 4WD Kluger should be OK, as long as it's in good shape, and you have paid particular attention to the tyres, which should be as-new, and you've made sure that tyre pressures are lowered to around 20psi for the rough stuff. I always recommend you carry, among other things, a tyre pressure gauge and a compressor to blow them up again once you get back to the bitumen. Looking at a long drive. I will be driving a 2011 AWD Kluger. Will it cope with the roads? Did this stretch in one winter day in a Mazda Tribute towing campertrailer. doubled up on tyres, carried 30L extra fuel & 20L water, CB radio, covered rear window with closed cell foam and we had no problems. think it is important to lower tyre pressures (20PSI for mine) as road is mostly crushed rock and 80kmph is about as fast as I wanted to go. After rain the development road can have water filled holes in some of the depressions, something to keep in mind. Don't forget to fuel up at Windorah - no servos between there and B'ville. Take your time and enjoy the unique outback. I only have a small low clearance front wheel drive Hyundai i30CW and would appreciate advice as to whether I can travel this road, bearing in mind that I would observe all precautions such as checking the road conditions etc on the day. 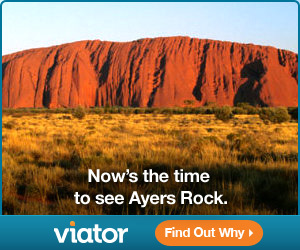 You can rarely over-prepare for an outback trip and sounds like you have it well covered. I assume you have an EPIRB or Spot Tracker? I have been to Birdsville several time and in relation to the Q re a Forester - I crossed the Simpson in my Forester and it also did the Old Tele Track at the tip so you will have no issues! In 2 weeks we are heading to the birdsville track then on to big red and then grom birdsville back home via the development track. 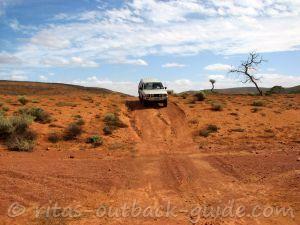 Hoping to drive from Darwin to Emerald in August and considering a detour to Birdsville. Will be towing an onroad caravan, so would like to know how much of the Developmental Road is sealed and the condition of any gravel road. 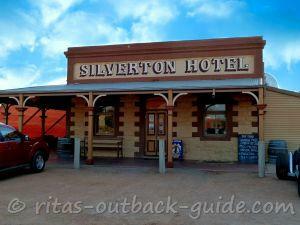 Should we considerleaving the caravan at Boulia if need be and stay at the Birdsville pub for a night. Anyone been that way recently? Can anyone tell me if the Birdsville Development Road is sealed please. I plan on going to Birdsville on my Trike towing a teardrop camper. What is the best time of year to travel to Birdsville? For what it's worth I'd carry 20 liters of water and 20 liters of fuel plus a second spare tyre if you have room. Also cake a cake of soap handy, if you hole the fuel tank on dirt roads it is great for sealing the hole. Further make sure you have a UHF CB radio. Others may disagree but from my experiences these are my recommendations. hey guys: A group of us girls are doing the trek from Brisbane in an SUV - Captiva Maxx ----- Do you think this would be ok? And the fuel consumption on this thing is silly at around 450klms a tank. Do you think that I will only need one tank of fuel? How would I take spare fuel? Can anyone tell me how far out of Windorah the bitumen finishes on the way to Birdsville, someone said to me that there's only about 170km's of dirt now, is that correct?? Plus any idea on the road conditions the week before the races, Cheers. mick, your van will do it without a prob. its a rough gravel road with small bits of bitumen and can be a little rocky but just take it easy. its not the wild west that it once was. but big red is well worth a look, and a night time concert would be unreal. Im looking at going to the big red bash in July this year have 4x4 and pop top van not off road and wondering it its feasible to take this van to B/ville. Has any body done this trip with a van thats not an off road van?Would be travelling from Sydney. We've done many of the Channel country roads in a Forester towing a camper trailer no problems, even when the 'tracks' are classed as 4WD only, after rain. You do need good tyres (AT LT recommended) and an aftermarket sump guard is a good investment (from SubaXtreme). to all the lucky people heading to Birdsville here's a couple of tips, ive been a few times and never had a prob finding a camp spot until last time (2012) you'll first notice the race track is way out of town. when you cross the bridge you can go left or right for camping which is about half way between town and the track. its nice there to be on the river but good luck finding a spot if you are not there early. don't worry about the distance from town as a bus run back and forth all day about every 30 mins. the closer you camp to town the more arid the camping is. as in no trees or water to camp beside. DONT drink and drive, I must have got tested about 12 times. if you need fuel fill up when you get there, the que at the end of the week-end is crazy. ps have a look at big red, only about 30 km out the other side of town but worth a look. wish I was going CHEERS. We are a couple of seniors off to Birdsville for our first time. We are leaving Plainland around 30th Aug along with our tent and look forward to meeting up with others travelling the same road, cheers to all. Right now there are no problems, but as you know, conditions can change any day. So please check weather reports and road conditions shortly before you go. 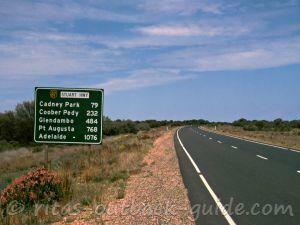 We are travelling from Walgett to Birdsville. Can anyone tell me what the road conditions are like at the moment. We are off to the races so we will be travelling late August. 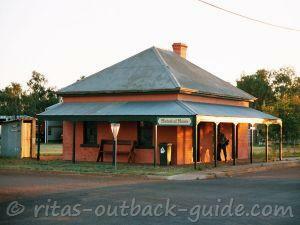 Assuming you are coming through betoota, there is no accommodation between Birdsville and Windorah. Just wide open spaces and plenty of places to pull up stump for the night. e had is idiots coming the other way that dont slow down. two smashed windows like that. so now i dont move over till they are almost on top of me and they brake, then i move over and give a friendly wave as they go past at a more windscreen friendly speed. just take it easy and enjoy the scenery, might be big open spaces but lots to see if you take the time to look. Have done this for years..
road conditions for a bus. you'll be fine. i take it you are going to the races, so are we. been there a few times in past years and seen lot of buses. just drive to the road conditions. its sandy, stoney and dirt. only prob ive had is idiots coming the other way that dont slow down. two smashed windows like that. so now i dont move over till they are almost on top of me and they brake, then i move over and give a friendly wave as they go past at a more windscreen friendly speed. 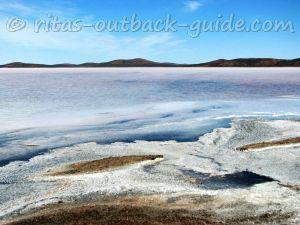 just take it easy and enjoy the scenery, might be big open spaces but lots to see if you take the time to look. We are planning to drive from Victoria to Windorah Qld within the next week or so. I have been able to find information on the conditions of the road up to Windorah all bitumen. We will be in a 1989 Hino Rainbow bus (motorhome) which is not 4x4. Can anyone PLEASE tell me what to expect when we leave Windorah heading to Birdsville. I'm worried about tyres, windscreen, fuel and the rattling of the bus in general. Any information would be greatly apprieciated. I have checked out your comments for ealier in the year, but Im off to Birdsville via Quilpie and hoping for advice please. I ahve a Hilux Dual cab with 3" lift kit, and am planning on towing 18' caravan poptop expanda... your thoughts? Normally I would take the camper but wanting to go 'Glamping' for the races?? I haven't been there for a long time. Apart from that, I think with all the recent rain it won't help you much what the Birdsville Developmental Road usually is like in April. So it really depends on when it was graded the last time, how much traffic went through in wet/damp conditions before you go. I guess many Outback roads that are usually easy to drive are in a mess this year. The road is unsealed from the junction with the Diamantina Rd until Birdsvile, 270km. You can call the information centres in Birdsville Ph: 07-4656 3300 or Windorah Ph: 07 4656 3063 before you go. Hello Rita we were thinking of travelling with a commodore sedan & a high lift 16.5 poptop from Cunnumulla to Birdsville by the Birdsville development road in late April . As you say the condition of outback roads can change over night but we just wondered what it is like generally as to wether any part of it is sealed and does it get badly rutted at that time of the year.I am familiar with the RACQ web site as to road closures in Queensland because of flooding. 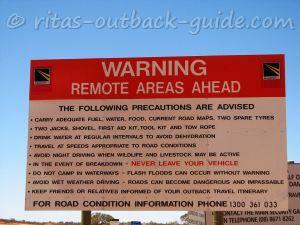 Return to Your Outback Driving Questions and Stories. 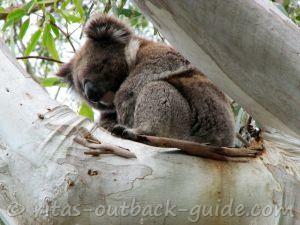 Need a map for your Outback journey? Click on the image to find a road atlas, maps, or any other travel gear for your journey! Copyright © 2007-2019 Rita Amend.